Houston, Texas – The much anticipated trilogy between Cain Velasquez and Junior dos Santos turned out pretty similar to their rematch, albeit with more definitive results. The 32 year old champ played the perfect game; he dominated dos Santos in all the aspects of the fight, even in the striking department where Cigano supposedly had an advantage. Just like their last fight, Velasquez negated the heavy hands of dos Santos by backing him up into the cage. The rest of the fight played out the same scenario; Velasquez controlling dos Santos in the clinch while chipping at him with dirty boxing. Cigano eventually succumbed due to the accumulation of punishment in the 5th round, he fell face first in to the canvass after a failed front choke attempt. Seeing Cigano’s vulnerable state, Referee Herb Dean decided to stop the fight with 3:09 remaining in the final round. According to Fightmetric, Velasquez out struck his opponent with 123 significant strikes while Cigano only landed 46. 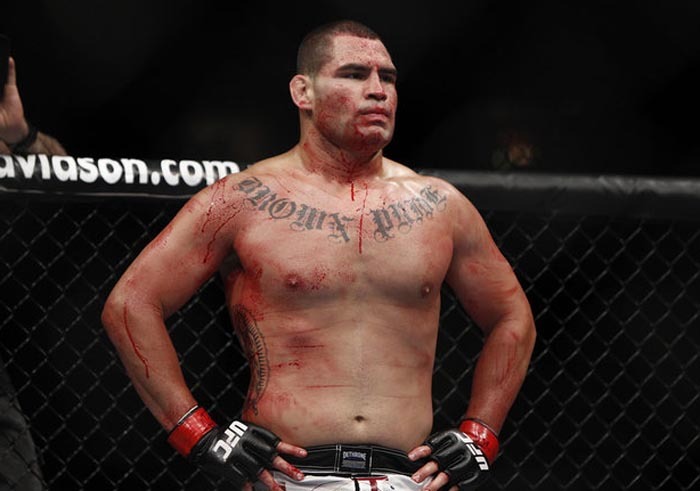 With the win, Velasquez solidifies his spot as the “greatest heavyweight in UFC history” as Dana White would put it. Cigano on the other hand will go back in line for another attempt at the heavyweight gold. In the co-main event, Daniel Cormier proved to be too quick and too well rounded for Roy Nelson as DC easily cruised into a lopsided decision. After the fight, he confirmed that it will be competing at 205 for his next fight. The third featured bout, a lightweight showdown between Diego Sanchez and Gilbert Melendez provided the most amount of fireworks than any match in the card. The two fought a back and forth battle in a fight that was described by Joe Rogan as “the greatest fight that I’ve seen on my life”. Sanchez and Melendez went right at it in the start of opening bell, they immediately engaged in a flurry that ignited the crowd inside the Toyota Center. Melendez slightly gained the upper hand when he landed a punch-elbow combination that produced a nasty cut above his opponents eyebrow towards the end of the first round. The two picked up where they left off at the start of the second round before the referee halted the action to check on Sanchez’ cut. It was deep but Sanchez was allowed to continue and the two resumed in their furious exchange of strikes. Sanchez, who was aware that he was behind in the scorecards, came out guns blazing in the final round. He pursued his opponent until he landed an uppercut that sent El Nino crashing to the canvass. The Dream followed his opponent to the mat and tries for a rear naked choke. However, Melendez easily escaped with the help of the blood that was spilled all throughout the fight. Both fighters will again engage in a frenetic exchange of punches towards the final bell. Melendez walked out with the decision win after the three rounds of war. In another heavyweight bout, Gabriel Gonzaga disposed Shawn Jordan in less than 2 minutes after the opening bell. Jordan was caught with a vicious counter after he missed with a left straight. The punch landed flush on his face and it sent him down to the mat. Napao immediately pounced at his downed opponent before the referee steps in at the 1:33 mark of the first round. The victory gave Gonzaga his third win in his last four fights, his record now stands at 16 – 7 (11 – 6 in UFC). Jordan, who suffered his second octagon defeat, drops to 15-5. John Dodson earned the knockout of the night honors when he stopped Darrell Montague in the opening bout of the main card. Dodson, who is known for his punching power, had his opponent in all sorts of trouble midway through the first round. He decked Montague with a looping left hook and followed him to the ground with a barrage of punches. Surprisingly, Montague survived the onslaught and made it back to his feet. Dodson, sensing that his opponent has recovered, backed off and waited for another opening. Dodson would land a hard straight left that completely shut the lights out of his game, but overmatched opponent.